Last weekend we did a Beer Run. No, not the kind of beer run where you're laying on your couch and suddenly remember you're out of beer and need to run to the 7-11. No, this was an organized run from one German gasthaus to another, sampling beers in each allow the way. It wasn't a strenuous run, around 4.5 miles. Of course, when you start planning something like this you have to decide which is more important, the beer or the run. When you're in Germany, I think the answer is quite obvious. Below is a map of our route. We started just outside of our village of Weilerbach at the blue pin, Bernd's Blockhaus (which happens to be owned by our landlords); then, blue route, on to Bauer Schmitt, the green pin; then into a whole other village, Rodenbach, red route, to stop at Da Roberto, yellow pin; and finally back on the green route to the red pin, Dionysus. The purple pin is our house in Weilerbach. Here's our group just before we started our run and after an inspirational beer to get us going; it's about 1745 (5:45 PM). Among our group is a bunch of our new A-10 friends stationed at Ramstein; Magneto and Beth, Cajun and Nicole, Crater and Erika, and old A-10 friends Keebs and Tina. Also, Scott and Chrissie, and Steve and Yana. 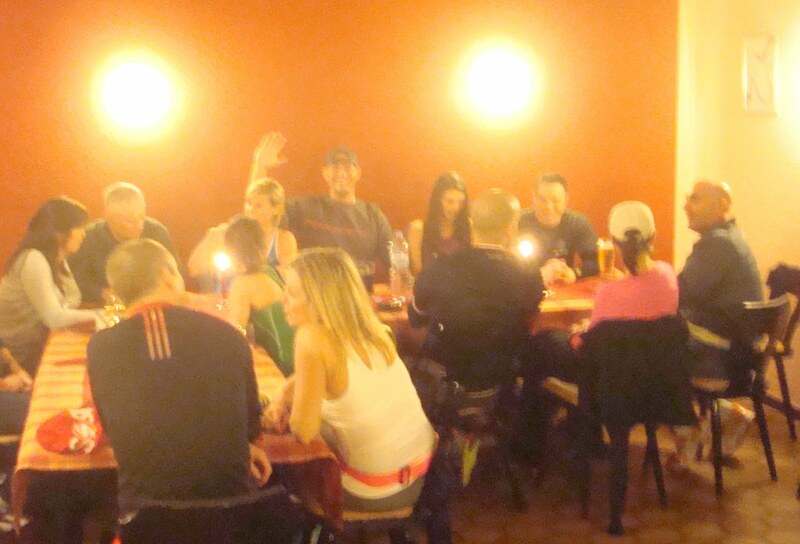 I must admit that a few of us didn't run but drove from gasthaus to gasthaus. I thought it important that someone make the sacrifice to get to each place early and ensure that they were ready for the incoming runners. This is one of the great running trails all around our area and throughout Germany. This one is a paved trail over the old railway line leading into the town. About at this point we're realizing that there's a rather chilly wind for us to confront. 1.6 miles complete and we're at Bauer Schmitt. By the way, Bauer is German for farmer. This place has been here for years and many U.S. service members stationed in this area in the past will remember Bauer Schmitt. Bauer Schmitt sign advertising one of the local breweries, Bischoff. This run was planned and organized by Erika. She had called or visited all the gasthauses we were going to intrude on so that they knew we were coming. The folks at Bauer Schmitt said we were welcome and they would even build a fire for us on their outdoor patio. Felt good! Next stop, after just a mile, in Rodenbach, Pizzeria Da Roberto, an Italian gasthaus and, as you can tell, it was getting dark. Here's an interesting point about a lot of these different ethnic restaurants in Germany; Italian, Greek, Chinese etc. They'll serve that particular countries specialties but on top of that they'll almost certainly serve the typical favorite German dishes; various schnitzels and rump steak. Actually, we were planning on going to a place next door, Schutzenhaus, but they were closed, so the folks at Da Roberto were a little surprised to see us. Look at that head!! Amber nectar at its best. Magneto behind, Keebs to the right. All the girls of the night. From the left, Chrissie, Erika, Beth, Yana, Nicole, me and Tina. Erika, who planned the run, and Beth. One last leg back to Weilerbach and a Greek restaurant, Dionysus. Of course, by now it's dark, a chilly breeze and a slight drizzle. Dionysus is one of those ethnic restaurants that serves great Greek food but also super schnitzel and as the sign says, really good pizza at a great price. Dionysus knew we were on the way and Erika had told them that we tend to be noisy. So they put us back in the sequestered smoking room and closed the door, which was perfect for us; no smokers but now our noise didn't bother anyone else. What a way fun evening!! Good friends, good food, good beer, easy run. PROST!! Oh, by the way, remember our new piece of "art?" We asked some Germans at the Blockhaus what this thing might be. The answer, "art." Nothing more, nothing less. Looks like a a great adventure. I love Erika's horns! Mom- you look good in your new jeans that you got in the states haha. Good to know that the sculpture is just "art". You went to all that trouble trying to figure out what it meant...what a waste!